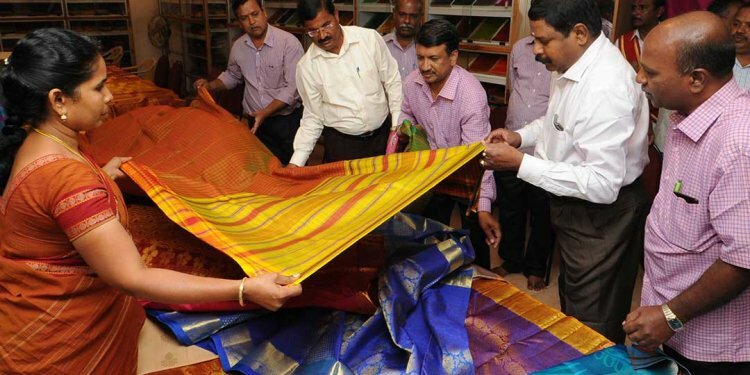 Cooptex, the Tamil Nadu Handloom Weavers' Cooperative Society, has introduced a wide range of cotton and silk saris, linen and naturally-dyed cotton shirts and readymades for this Deepavali season at attractive prices. First time, naturally-dyed cotton saris and organic cotton saris are introduced for this festival season. With the grand success and amazing response for linen shirts among young buyers, Cooptex has planned to introduce linen saris to lure young women, for this season. It will hit the stand shortly. Aesthetically-designed pure silk saris are also available at affordable rates. Prices of silk saris range from Rs.3, 000 to Rs.7, 500. Several new designs in chudidhars, saris for special occasions such as marriage are also available at competitive prices. Cooptex offers 30 per cent rebate on most of the products. Besides silk saris, summer cotton collections, fine quality cotton saris meant for all age groups, Kora cotton, synthetic saris, fancy saris and silk-cotton saris are also on display to draw customers of all ages. Linen shirts, pure silk shirts and silk dhotis, lungis, dhotis and towels are available for the men folk. Bed sheets, carpets, footrests, bedspreads, cotton carpets, tabletop and door mats would certainly draw homemakers to the shop. The State and Central government employees can avail loans to buy these products. Launching the Deepavali sale at the Cooptex showroom here on Wednesday evening, Collector T.G. Vinay said Cooptex had sold goods worth Rs.23.63 crore through 20 sales outlets in Madurai zone, last fiscal. The target for this fiscal is fixed at Rs.30 crore. Sales during last year in three shops in Dindigul was Rs.2.19 crore. Target for Deepavali sale for these shops is set at Rs.2.55 crore. Thanga Mazhai, special savings scheme is available till January 31, 2017. A coupon would be given to customers who buy textiles worth Rs.2, 000. They should answer questions given in the coupon. Best answers would be selected and five winners in each zone would get eight grams of gold and second price winners would receive four grams of gold coin, he added.